A team from the First Lady’s office and Multimedia Group has toured construction site for the new Mother and Baby Unit for Komfo Anokye Teaching Hospital, spearheaded by the First Lady Mrs. Rebecca Akufo-Addo, to assess the extent of work since sod cutting in May 2017. The tour, conducted by Engineer Stephan Coret of Africa Building Partners, contractor for the Mother and Baby Unit facility, took the team round and showed them the extent of work. 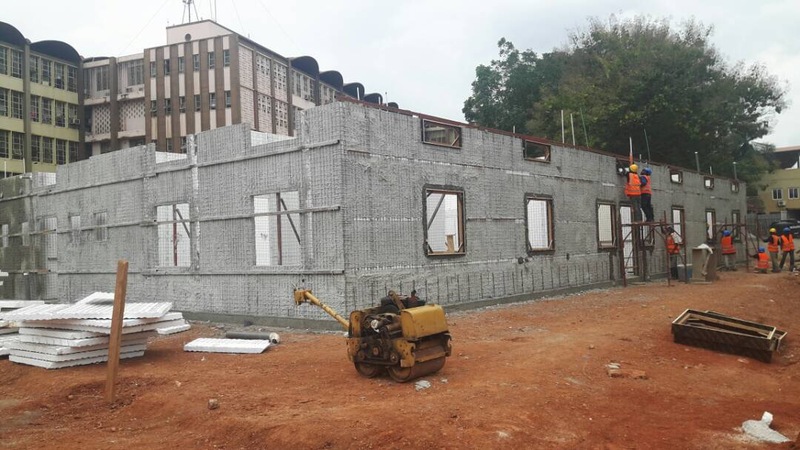 Work on the 1500 square meter Mother and Baby unit at Komfo Anokye Teaching Hospital is fast progressing with the physical structure now nearing lintel stage. According to the Site Engineer Stephan Coret, his team is working tirelessly to ensure the facility is completed and commissioned on schedule. Managing Director of Multi Tv Santokh Singh who led the Multi-media team expressed his excitement at extent of work done considering the tight schedule the contractor is working with. Mr. Kwaku Kwakye who led the team from the First Lady’s office also expressed the First Lady’s gratitude to all those who have contributed and supported the project in various ways to ensure its steady progress. The First Lady Rebecca Akufo-Addo initiated the project in collaboration with the Multimedia group, following a Joy News documentary dubbed “Next to Die” which revealed that about four babies die everyday at the hospital due to congestion and it’s accompanying infections. The First Lady subsequently launched a fundraising drive to construct a facility, which when completed will increase the current facility’s capacity by five times.